The borough commissioners’ meeting on Sept. 13 may not have had many people in attendance, but the Pledge of Allegiance was said loudly and proudly. 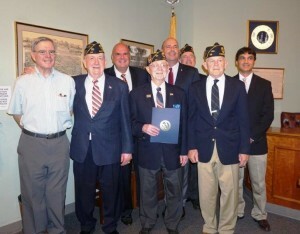 Members of the American Legion Post 38 were in attendance to accept a proclamation in honor of POW/MIA Recognition Day. “Thank you, gentlemen, for coming and accepting this proclamations on behalf of all veterans and our POWs/MIAs,” Mayor Jeff Kasko said. The United States’ National POW/MIA Recognition Day is observed across the nation on the third Friday of September each year. Many Americans take the time to remember those who were prisoners of war and those who are missing in action, as well as their families. Each year, the borough commemorates POW/MIA Recognition Day with a proclamation. On Sept. 16, the stark black and white banner symbolizing America’s Missing in Action and Prisoners of War is being flown over Borough Hall and other locations in town. The flag is raised as a solemn reminder of obligations to always remember the sacrifices made to defend our nation, according to the proclamation. Legion member Al Peak, a veteran of World War II, invited members of the community to Lindenwold Memorial Park on Saturday, Sept. 17 for a POW/MIA remembrance ceremony. It is held there every year, but normally was held on Friday, Sept. 16 at 6 p.m. This year it is being held on Saturday at 10 a.m. so more people could hopefully come out. • Andrew Defina was accepted as a new member of the Haddon Fire Company №1. He was sworn into the fire company by Commissioner Neal Rochford. • Commissioners also approved a bid for a 4×4 crew cab pick up with plow for $39,380. It came in lower than estimated, according to business administrator Sharon McCullough. • The next commissioners meeting is Sept. 27 at 7:30 p.m. in Borough Hall.